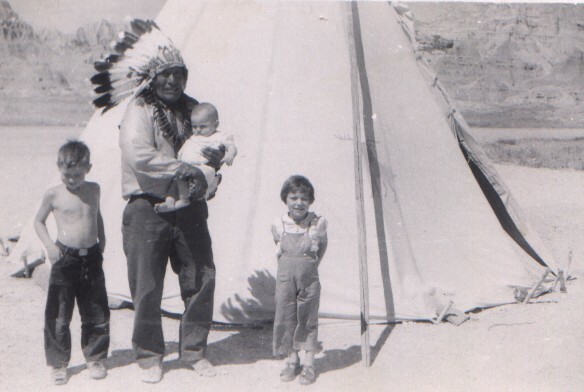 This picture was taken in the summer of 1946 at the tipi of Iron Tail & his wife Alice at Cedar Pass, South Dakota. Iron Tail was 90 yrs. old when this was taken. (shown left to right are James Lewis Brown, Chief Iron Tail, John Ashley Brown, II (being held) & Marilyn Grace Brown (Hoffman). Iron Tail, was a member of the Lakota tribe of the Sioux Indian Nation, born in 1857 in South Dakota. 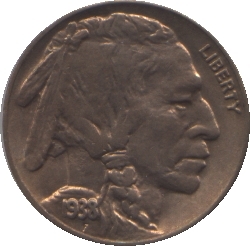 His real Lakota name was Wasee Maza which meant Iron Tail in English. At the age of 99 in November of 1955, he was the last survivor of both The Battle Of The Little Big Horn in 1876, and The Battle Of Wounded Knee in 1890. 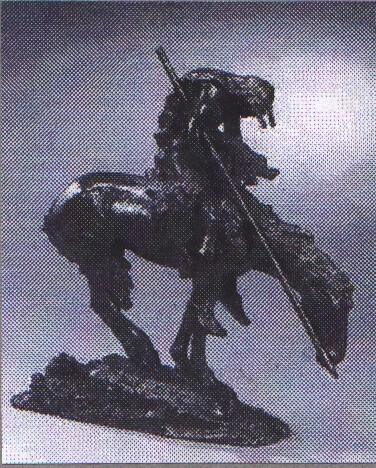 Iron Tail was only a boy when the warriors under Crazy Horse defeated General George Armstrong Custer and his Seventh Cavalry at the Little Big Horn in 1876. During this battle one of four other young Lakotas challenged the others to try to capture Custer alive. After all it would be more challenging to capture him than to simply kill him. They however had no idea what they would do with him if he was captured. When the golden-haired general came into view they charged, and just as Iron Tail was within arms of Custer a Minneconjou warrior named Charging Hawk shot & killed Custer. After the battle was over Iron Tail saw Custer's horse reins still tied to his wrist. Supposedly this is when Iron Tail took the 7th Cavalry jacket and gunbelt that he wore at Powwows years later. Then at The Battle of Wounded Knee in 1890 Iron Tail was twice seriously wounded, and seven members of his family were killed, including his mother, father, two brothers, sister, wife and later his infant son. This infant son, Wet Feet, died the next March as a result of the battle. "This child was nursing its dead mother who was shot in the breast. It swallowed blood and from this vomited and was never well, was always sick till it died." In March of 1891 Buffalo Bill Cody, after receiving the consent of the government, left for Europe with the "hostile Sioux" then held at Fort Sheridan, to be part of his Wild West Show. Annie Oakley with others also was part of that show. 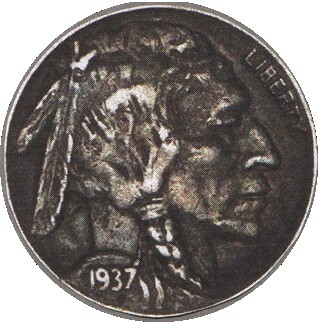 Buffalo Bill was later quoted as saying "Iron Tail is the finest man I have ever known, bar none". Years after Wounded Knee Iron Tail was invited to Washington, D.C. by General Nelson Miles, who introduced him to many military officials. One naval hero, Admiral George Dewey, impressed him so much that he created a new name for himself by combining an old Sioux nickname-beard to the Admiral's surname, thus the name Dewey Beard. While in Washington, D.C. Iron Tail was chosen with two other Indians, Two Moons, a Cheyenne and Big Tree, a Kiowa as models by James E. Fraser to create the Indian head profile on the Buffalo Nickel used from 1913-1938. On October 21, 1913 Dewey Beard received a commendation certificate of "good character" from the U.S. Government. Iron Tail returned to South Dakota where he married his second wife, Alice. They had a son named Tommy, and spent their summers at Cedar Pass in the Dakota Badlands where they posed for tourists by their canvas tipi. I don't know when Alice died, but when Iron Tail was 97, tuberculosis took their son. According to Guy Dull Knife Jr. he mourned in the old Lakota way, cutting his hair and slashing his arms and legs. He was sitting in a pool of blood, crying and wailing in grief and pain and no one could get through to him. He was then taken to the hospital for treatment. He lived through more than anyone I have ever known, but he did not live long after Tommy died.